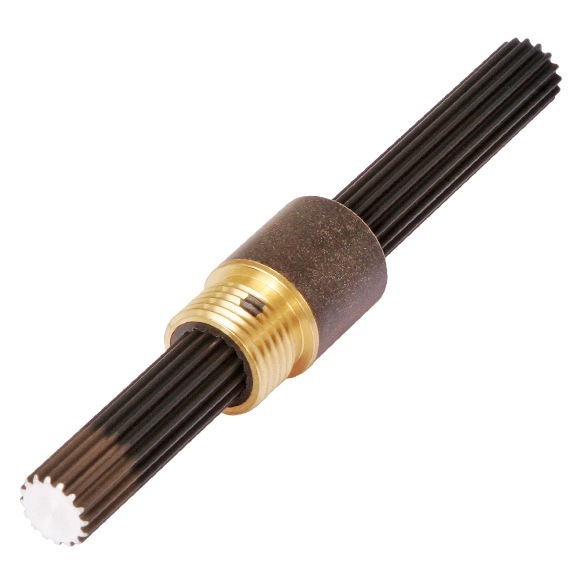 The SS Series Spline shafts are available in 5 sizes from 1/8” to ¾” (3.18 to 19mm) diameter. Bushings are available in either a plain or threaded interface. SS 02 3.18 0.45 2 Spline, general purpose, light to moderate loads, low cost, low friction, and long life. Please note: Metric numbers are for reference only. Spline Shaft stiffness may be modeled as a round rod with diameters given. 0.125-in rail size only available in SSAP and SSAT styles. Kerk Spline Shaft SS assembly consists of a stainless steel spline shaft treated with Haydon Kerk Motion Solutions™ proprietary low friction Kerkote® TFE coating, mated with a Kerkite® composite polymer bushing. Kerkote TFE is a soft coating, a long-term dry lubricant that is optimized for softer plastics like acetyls and nylons, with or without mechanical reinforcement. Lubrication to the nut / lead screw interface occurs by the bushing picking up Kerkote TFE particles from the coating as well as from the migration of the internal lubricant within the plastic. Haydon Kerk can custom-design and manufacture unique spline shaft solutions for your equipment requirements. Special rail lengths, multiple carriages, alternate lead screws, and lubrication are just some of the typical adaptations engineered to customer needs. Every Haydon Kerk linear rail product is supported by an experienced technical team recognized for innovation, customization, and dedicated customer service. Proprietary suffix assigned to a specific customer application. The identifier can apply to either a standard or custom part. NOTE: Dashes must be included in Part Number (–) as shown above. For assistance call our Engineering Team at 203 756 7441.